George Zavatsky and Michele (Darrall) Zavatsky are called "the family that goes on vacation for a living." Over the past several years, they've researched and published several best-selling state travel books. To accomplish this, they spent thousands of hours in research, travel, and writing to produce books that they would be proud to use. Head over to their website Kids Love Travel to find out about all the amazing products they offer adventure loving families. As you know we love traveling. And we are more of a road-schooling family than a homeschooling family! Right now we are limited to our amazing home state of Georgia, which is fine because Georgia offers a WIDE variety of things to do. 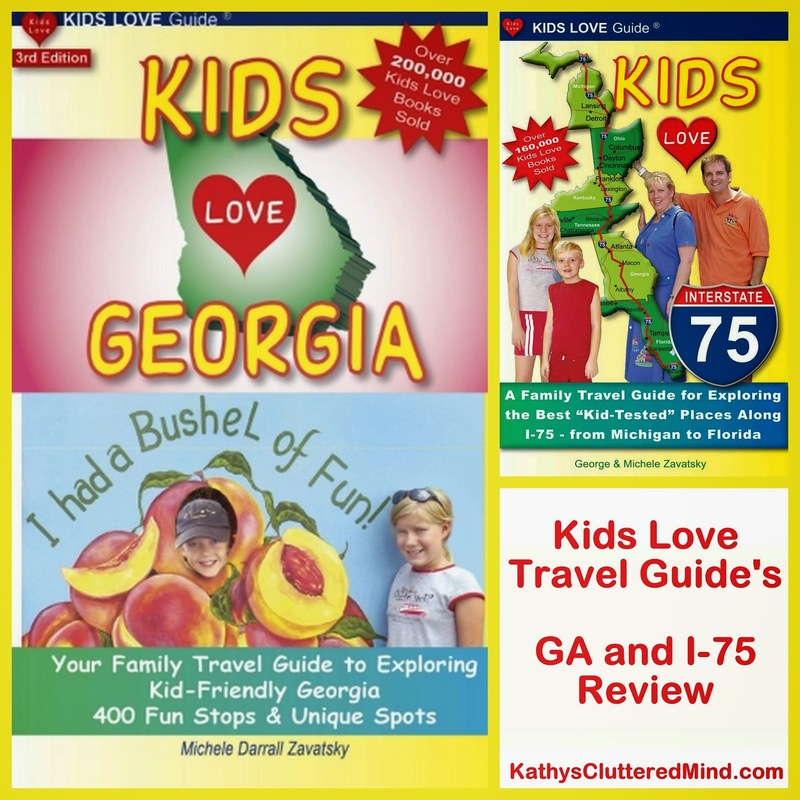 I thought I knew of all the amazing things there were to see...that was until I received a copy of Kids Love I-75 and Kids Love Georgia to review. Whether you are just looking for a quick adventure close to home or planning for a long journey, each of these detailed books will save you hours of research and provide your family with tons of fun! Each of these books contains hundreds of activities as well as lodging and restaurant suggestions. Other books in the Kids Love Travel series include: Illinois, I-95, Florida, Indiana, Kentucky, Michigan, Maryland and DC, Missouri, North and South Carolina, Ohio, Virginia and DC, Tennessee, Pennsylvania, Wisconsin. One of my favorite things about these guides, which sets them apart from others, is that they include links to teaching materials that may be available on the attraction websites. I had the opportunity to review an eBook and paperback version of two different Kids Love Travel guide's, below is information on each of the books we received. Kids Love Georgia (eBook): The Kids Love Georgia guide is 216 pages with over 400 listings, broken into 6 geographical zones. Everything you could possibly be interested in exploring in Georgia is listed in this comprehensive book from hidden islands to historic gold mines. It is the perfect book for locals or those planning a vacation to Georgia. In the front of the book you will find general information which includes information on how to use the book, maps, tour ideas, city listings, geocaching information and more. Each chapter is broken up into a day trip zone (NE, NW, MW, ME, SW, SE) and highlights the best kid-friendly points of interest, events and author-tested lodging and dining. Each of the zones spans a 2 hour radius. Each chapter starts out the same and includes an overview of the activities, lodging and dining you will find in the chapter. This is followed by a map and some brief history on the zone area. Next you will find detailed information on each of the sites and attractions. This information includes address, pricing, web address background and/or historical information and more. The book is very easy to navigate and the keys, descriptions and maps were all very easy to follow. In the back of the book is a comprehensive index. I have spent hours searching the internet for Georgia activities to list on my blog and share in my Southeast Fieldtrip Facebook Group, so imagine my surprise when I discovered several things in the book that even I didn't know about. The interactive eBooks are available as an instant download and will work on a computer or other e-reader device (iPad, Nook, Kindle, Android, etc). Though I do prefer paperback books the eBook does have several advantages: more affordable, instant delivery, interactive website links and direct links, highlighting and/or sticky note features and more. In just 20 minutes you can have your entire trip planned out. No more searching the internet for hours on end. Everything you need including facts, prices and exclusive, expert kid-tested reviews are included for every listing in the guide. There are even lots of FREE places included in the guide to save you money as well! Kids Love I-75 (paperback): The Kids Love I-75 book is 370 pages with over 400 listings, spanning 6 states and 91 maps. This multi-state guide offers the best of I-75 from Michigan to Florida. All of the attractions listed in the book are within 10 miles of the freeway. You will also find lodging and restaurant suggestions too. In the front of the book you will find general information which includes information on how to use the book, maps, tour ideas, money saving tips and more. Each chapter is broken down into sections by state starting with Michigan. After reading a quick introduction for the state which highlights some of the authors favorites places within the chapter, you will find a list of activities by topic and exit number for easy reference. Topic categories include amusements, animals & farms, history, museums, outdoor exploring, the arts, tours, science, sports, welcome centers and suggested lodging and dining. There is no doubt you will find something for everyone in your family. Next you will find several maps that break down the interstate into 20 mile increments. Each of these maps includes a box with the exit number and family-tested attractions, eateries and lodging that can be found off that exit. You can also find rest areas, hospitals and indoor/outdoor play areas listed on the map. If a section of highway doesn't have any stopping points you will see a message saying to enjoy the scenery or play some travel games! After the maps you will find detailed information on the sites and attractions listed in order by exit number and distance from the exit. These details include address, pricing, web address background and/or historical information and more. In the back of the book is a comprehensive index. This guide is really handy for an I-75 adventure and is the perfect guide for young navigators. The guide came in quite handy on our South Georgia Adventure this summer. Everything you need for a perfect roadtrip is included in this guide. And just like the Georgia guide there are lots of FREE places included in Kids Love I-75 too. If you are looking for the perfect resource to help you plan out fieldtrips, daytrips, side trips, weekend getaways or vacations then pick up one or all of the Kids Love Travel guide's! Spend less time researching and planning and more time traveling! Though it is mentioned in the guide's remember that things change (prices, websites, addresses, etc) so always be sure to call or visit the website ahead of time to confirm details prior to your arrival. The Kids Love I-75 paperback is currently $17.95 plus shipping, and the eBook version is $15.95. The Kids Love Georgia paperback is currently $16.95 plus shipping, and the eBook version is $12.95. Both can be ordered directly through KidsLoveTravel.com. All of the books can be purchased on Amazon too.